I just got a phone call from Leslie, who is at an environmental conference in Newark. Leslie bumped into a woman I worked with years ago, Ms. Dorothy Knauer, a community activist who can (and has) moved mountains. Ms. Knauer updated Leslie on a Newark high school student who had spent a summer with me about 15 years ago. Dr. Hunte is now a professor at Purdue University. Let me make one thing absolutely clear--Haslyn was one of those kind of high school students who shine no matter who is in their lives. I have nothing to do with his success, but am beaming ear to ear anyway. I was a pediatrician at the time I met Haslyn. He wanted to do something on the Big Blue Bus (our pediatric mobile medical unit). Sure, fine, I said, not expecting much. Within a month, Haslyn was running a survey with an educational component on breast-feeding by impoverished mothers. Had I known how brilliant and hard-working he was, I would have stopped him long before I had to explain to administration why I was doing human studies on my patients without consent from the Institutional Review Board. Had he published his results, I would have been toast. Dr. Hunte wanted to go into medicine at the time. He would have made a fine physician, but his decision to go into public health will prove far more useful to far more people than any medical practice. Dr. Hunte’s main area of research is population health, focusing on racial/ethnic disparities in health. Using a multidisciplinary system approach, Dr. Hunte seeks to bridge the gap between the social and biological sciences by understanding health as a result of complex and dynamic interactions between physiological, behavioral, psychological, and sociodemographic factors. 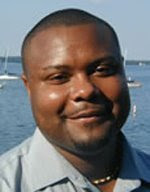 Dr. Hunte's current research activities include (a) studying the impact of perceived discrimination as a psychosocial stressor on health outcomes and on maladaptive coping health behaviors, such as smoking, drinking and substance use/abuse and (b) the impact that Black Caribbeans in the U.S. may have on the observed Black-White disparities in various health outcomes. A tiny piece of me hopes that Dr. Hunte's summer on the pediatric van helped focus his career choices. I will say this, though--my time with Haslyn, teaching a young man a little bit about medicine, helped foment my teaching career. Working with a student as blessed as Dr. Hunte was then (and now) made me realize how intoxicating teaching can be. Thank you, Dr. Hunte--you changed my life.